Hackers Tweak FIFA On Corruption, As Reform Advocate Quits : The Two-Way FIFA's efforts to rehabilitate its tarnished public image were dealt twin setbacks Monday, as the Twitter account of the international soccer federation was hacked and used to send a message joking about corruption. And a member of its reform committee quit, saying their work was pointless. Even before FIFA President Joseph Blatter announced the 2018 and 2022 World Cup host countries in December, 2010, accusations of corruption were rampant. A panel meant to restore FIFA's image lost a member Monday, as Alexandra Wrage said it was accomplishing nothing. FIFA's efforts to rehabilitate its tarnished public image were dealt twin setbacks Monday when the international soccer federation's Twitter account was hacked and used to send messages joking about corruption. And a member of its reform committee quit, saying they were making no progress. Paraguay's Nicolas Leoz resigned from FIFA's executive committee Tuesday, the same week an extensive report on bribery from the group's ethics investigator is to be released. Leoz, 84, said he is stepping down for health and personal reasons. He has denied the claims against him, which range from receiving $130,000 from a FIFA marketing partner (the AP) to requesting a knighthood "in return for supporting England's bid to host the 2018 World Cup" (the BBC). The attack on Twitter accounts belonging to FIFA and its president, Sepp Blatter, was apparently in response to the awarding of the 2022 World Cup tournament to wealthy Qatar. 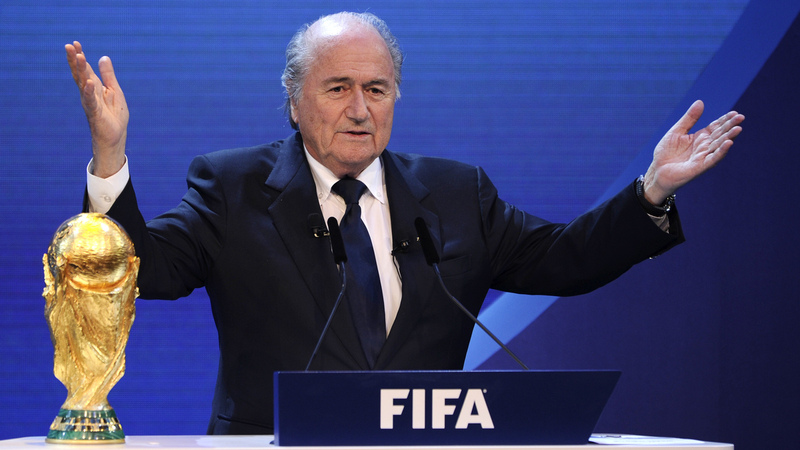 After Blatter's account tweeted, "So what if I took money from Qatari prince? I am the family's bread earner," the message was retweeted at least a thousand times — including by the FIFA World Cup account, which had also been hacked. That and other messages have since been removed, but not before they were compiled by sports site NESN. One of the final messages was a claim of responsibility by the Syrian Electronic Army, which has previously hacked accounts belonging to the BBC, CBS, and NPR. Also on Monday, FIFA's Independent Governance Committee, a panel of anti-corruption advisers, lost member Alexandra Wrage, whose Trace International helps groups fight bribery. In a Forbes piece this morning, Wrage writes that the panel, formed to restore public confidence in FIFA, "has done little more than polish the veneer on an outdated men's club." The Independent Governance Committee has pushed for full disclosure of salaries and bonuses for FIFA's executives, as well as more transparency in its selection process for tournaments. Wrage told Bloomberg on Monday that she resigned from the panel "because it was not having any impact." She added: "It's been the least productive project I've ever been involved in. There's no doubt about that." Wrage quit after serving on the reform panel for more than a year. She told the news service she was frustrated that the committee wasn't able to get its recommendations onto the agenda for FIFA's upcoming congress at the end of May. And she writes in Forbes that FIFA, which has faced calls to institute term limits and reform its internal voting process, has no reason to change. "The only entity capable of insisting on transparency at FIFA is the Swiss government," she says, "to which FIFA's unapologetic opacity should be as embarrassing as its $1.4 billion in tax-free reserves are interesting. I hope they will act." Many expect Blatter to declare the reform committee's work completed after next month's congress, deeming it a success. The most recent developments follow close on the heels of a report by CONCACAF's Integrity Committee, in which it laid out a number of accusations against former FIFA Executive Committee members Jack Warner and Chuck Blazer, who had been top executives at CONCACAF until 2011.